AmazonSmile – Shop to Give! 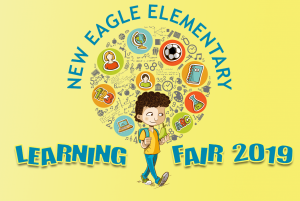 We are pleased to announce the 2019 New Eagle Elementary School Learning Fair will be held the week of March 11-15, 2019! During this week, the Large Group Room will be filled with displays from students in grades Kindergarten through 4th grade showing off their amazing knowledge. All students are invited to submit a project for the Learning Fair, and the project may be on any topic they choose – science, sports, math, music, art, history, a hobby – anything they know a lot about! This is a non-competitive event open to all students, and partner/team projects are permitted! Applications for projects will be accepted now through February 22nd, so please submit your applications soon! For more information, topic ideas, or to apply, please visit the Learning Fair page. Volunteers Needed for 1st Grade Rainforest Day! © 2018, New Eagle Elementary School PTO. All rights reserved.